The tractor-loader-backhoe (TLB) market in southern Africa, as it is popularly known locally, is a lucrative, but seemingly over traded market with several brands vying for a share of the market. 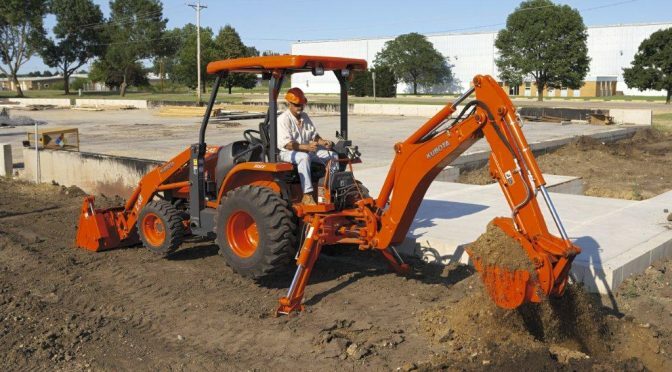 Smith Power Equipment, or SPE, the South African distributor for Kubota, believes that in the new Kubota L45 TLB, it offers a solution that sets it apart from the competition. 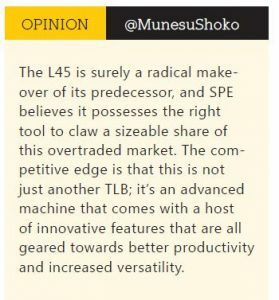 Greg Bergmann, operations manager at SPE, tells Plant Equipment & Hire that the L45 is a niche machine in every sense of the word, and its several innovative features separate it from the rest of the competition. For starters, its 3.2-tonne (t) operating weight makes it a lot lighter than most offerings in the market. “It is not as heavy. It is narrow and much more compact so that it can fit easily into buildings, fitting the bill for building contractors, landscapers and property developers,” says Bergmann. This machine is also ideal for civil contractors and rental companies. The L45 is said to be a radical redesign and upgrade from the previous model. 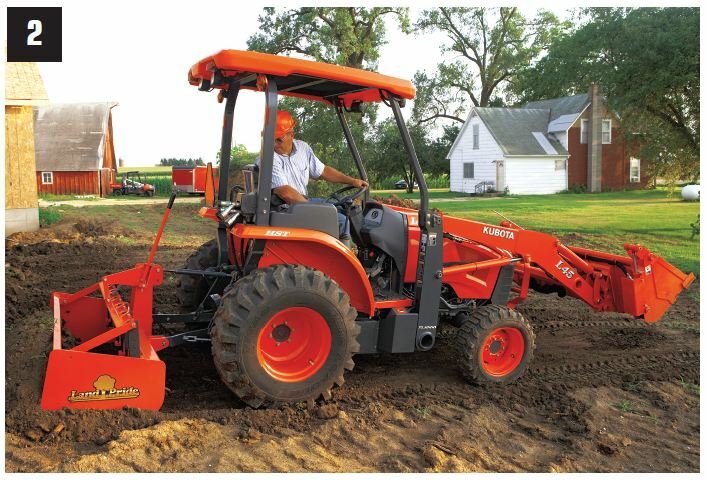 The real game changer on this machine is the new Kubota HST Plus hydrostatic transmission that replaces the conventional Glide Shift Transmission (GST) on the predecessor model, the L39. The L45 is also powered by a four-cylinder Kubota diesel engine which generates 45 gross horsepower (hp), compared with the 39hp on the previous model. With 1.6t of breakout force, the L45 has a lifting capacity of 1t at a maximum lifting height of 2.8m. The heart of this machine, as Bergmann reasons, is the advanced technologies that offer versatility required in the different applications this machine is targeted to operate, be it hauling, loading, digging, tilling or cutting. The major talking point is the HST Plus transmission which allows for automated control over the HST pump and motor. Benefits include hydro dual speed (H-DS), which adds High and Low to the three ranges, effectively making it a six-range transmission. There is also Load Sensing, which comes in three settings: Manual for when the operator wants full control; Stall Guard to prevent engine stalls when doing loader work; and Auto H-DS which automatically upshifts/downshifts for hills and other condition varying loads. Response time in the latter mode is said to be fully operator adjustable. 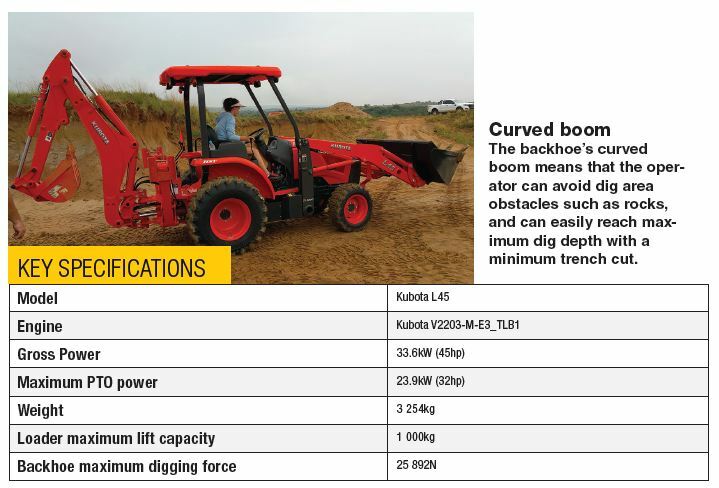 Backhoe crawling mode is another high-tech feature on the L45 TLB. This is an ultra-slow gear range that allows the operator, while behind the backhoe controls, to move the tractor at creep speed. “Auto Throttle Advance is another exciting feature of the HTS Plus transmission,” says Bergmann. When it is engaged, the operator can just press down on the hydro pedal and engine speed will increase to match the demand. Contrariwise, the operator can lift on the hydro pedal and engine speed will throttle down accordingly. “It’s a great time-saving feature that also significantly saves fuel,” says Bergmann. Backhoe crawling mode is another high-tech feature on the L45 TLB. This is an ultra-slow gear range that allows the operator, while behind the backhoe controls, to move the tractor at creep speed. With this feature, there is no need to reposition while digging lengthy trenches, and this certainly improves jobsite productivity. The front loader of the machine comes with an auto-levelling valve that automatically keeps the bucket horizontal as the loader boom raises and lowers. The on/off switch deactivates the system for greater operator control. As a result, spills are reduced, while loading is made easier. The machine’s slanted boom design provides operators with a better view when changing attachments, while on a lighter note, Bergmann adds that it also gives the TLB a more sleek and modern appearance. With safety in mind, the L45 comes with a standard spark arrestor muffler mounted under the hood. This helps ensure the operator is safe when working around dry fields, grass or in areas with combustible materials. The independent Power Take Off (PTO), a generous 32hp on the L45, allows the operator to engage and disengage the rear PTO while the TLB is in motion. As a result, there is no need to stop the machine’s advance to engage or disengage the rear PTO. Additionally, for safer and more convenient PTO use, the L45 also features auto shut-off and protective flip-up shields. As an option, Kubota also offers three Remote Hydraulic Control Valves for the L45. This affords a sound selection of hydraulically powered implements. The versatility of this system translates into a convenient and cost-effective solution. Several other features on the L45 are geared towards increasing the machine’s uptime. The simple-to-use quick coupler on the front loader offers easy on/off for buckets with no need for any tools; only mounting pins and hose couplers. This allows the operator to move onto the next task in a matter of minutes, reducing downtime related to the changing of attachments. The backhoe also features a four-point quick-mount attach/detach system, allowing the backhoe to be removed and installed easily. “With our optional quick coupler, changing buckets is faster. This is an ideal option for those who do a lot of bucket work and frequently change bucket types,” says Bergmann. The L45’s brace-free loader frame design improves visibility and accessibility over the hood, to the side and when servicing the engine, reducing downtime related to routine maintenance and service of the motor. The backhoe’s curved boom means that the operator can both avoid dig area obstacles, such as rocks, and easily reach maximum dig depth with a minimum trench cut. “The boom design is curved to clear side boards and position materials in the centre of the truck bed when loading,” says Bergmann. The new L45 TLB is ideal for contractors, landscapers and rental companies. The optional auxiliary hydraulic control valve and hydraulic thumb are said to offer greater versatility when working with the backhoe. This reduces installation time, especially with a built-in thump bracket as standard equipment. In line with Kubota’s belief that a comfortable operator is a productive one, the L45 also comes with several features geared at operator comfort. The width between the fenders on the L45 has been increased by nearly 75mm compared with the previous model, and some of that room has been used to add arm rests. 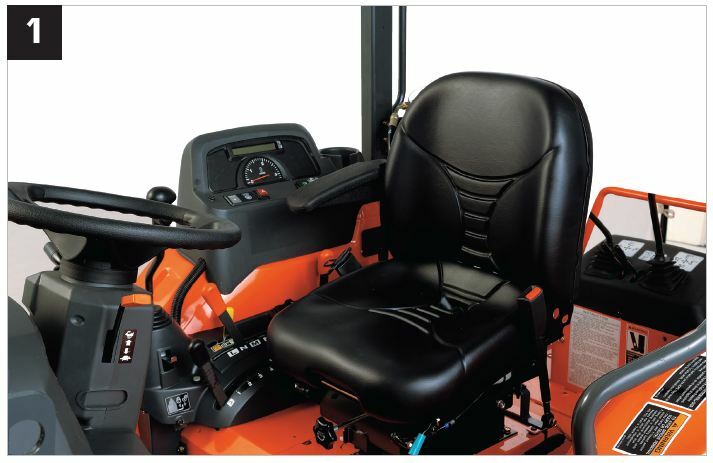 That, coupled with the high-back suspension seat and ample space to rotate from front loader to backhoe position, means a comfortable operating platform. 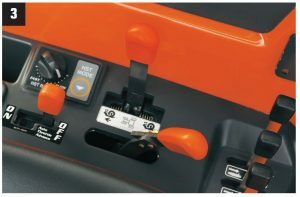 All the controls are colour coded and ergonomically laid out on the IntelliPanel, Kubota’s LCD panel. Indicator and warning lights wrap both the sides and an LCD panel at the top, giving the operator an instant readout of all pertinent information. Launched locally in January this year, the L45 TLB is proving to be a quick win with nine units already operating in the field at the time of writing. SPE is confident that the L45, with its array of innovative features, will outsell its predecessor model, the L39, which has a population of over 1 200 units operating in southern Africa today. This will also be achieved through SPE’s strong focus on its extended footprint of more than 40 dealers around South Africa and a whopping 92% of parts availability. At the time of writing, a new dealer to focus on the Kubota range had just been appointed in the Witbank area of Mpumalanga. Meanwhile, having launched the Kubota range of compact excavators locally in 2013, Charl Kemp (who is in charge of that range at SPE), has reported an increased demand for the range. Sales are picking up, and at the end of the first quarter of 2016, Kemp expected to sell more than the 24 units sold on the whole in 2015. At the time of writing, 13 units had already been sold since the beginning of 2016. Agriculture remains the most lucrative market for this range, but Kemp says a few more units are going into mines and quite a bit into construction. Plant hire companies are also taking delivery of these units, using them with hammers and other attachments for a wide range of applications. This article was featured in the Plant Equipment and Hire -July 2016.